What can I do to keep insects away? What's the proper way to use insect repellent? What's the best way to remove a bee stinger? What should I do if I find a tick on me or my child? What can be done for itching and pain from bites and stings? When is medical attention needed? Where can I find more information on bug bites and stings? Keep insects away by using structures such as screens and netting; wear long sleeve shirts and long pants when possible, and use insect repellents that contain DEET. Insect repellent should be applied after sunscreen and the repellent should not contain more than 10% DEET; follow the insect repellent label instructions, especially those instructions suggested for children. Itching and pain from bites and stings can be treated with topical analgesics, ibuprofen, and acetaminophen. Medical attention is needed for bites and stings that cause allergic reactions, especially anaphylaxis (for example, bee or wasp stings), or for symptoms of diseases that are transmitted by vectors like mosquitoes or ticks or if the bite site becomes infected. References provided allow readers to get more information about various bug bites and stings. Warm weather makes it easier to spend more time outdoors, but it also brings out the bugs. Ticks are usually harmless. But a tick bite can lead to Lyme disease, which is caused by the bacterium Borrelia burgdorferi. The bacteria are transmitted to people by the black-legged deer tick, which is about the size of a pinhead and usually lives on deer. Infected ticks can also cause other diseases, such as Rocky Mountain spotted fever. Another insect-borne illness, West Nile virus, is transmitted by infected mosquitoes and usually produces mild symptoms in healthy people. But the illness can be serious for older people and those with compromised immune systems. Most reactions to bees and other stinging insects are mild, but severe allergic reactions can be deadly. An allergic reaction can occur even if a person has been stung before with no complications. Here are tips for preventing and treating bites and stings. I hate bugs, especially the ones that "bite." For me, I lump all stinging and biting creatures into this bug category, so I choose to use the general definition of "bugs" to include all insects and insect-like invertebrates that bite or sting. Some people are more susceptible to bug bites than others. I am one of those unlucky people that mosquito populations must have a personal vendetta against. Consequently, I have had some experience with bug bites. Use structural barriers such as window screens and netting. Avoid wooded, brushy, and grassy areas when possible. Don't wear heavily scented soaps and perfumes. Use caution eating outside and drinking; don't leave drinks and garbage cans uncovered. Don't wear bright colors, which attract bees. Wear long sleeves and long pants when possible. Tuck pant legs into socks or shoes. Wear a hat for extra protection. Get rid of containers with standing water that give mosquitoes a breeding ground. Examples include water in flowerpots and outdoor pet dishes. Use insect repellent if nonchemical methods are ineffective and you spend time in tall grass and woody areas. Treat camping gear, clothes, and shoes with permethrin, which repels and kills ticks, mosquitoes, and other insects. Clothing that is pre-treated with permethrin is also commercially available. It's okay to use insect repellent and sunscreen at the same time. The general recommendation is to apply sunscreen first, followed by repellent. There are also some combination products that contain both insect repellent and sunscreen. FDA regulates sunscreen as an over-the-counter (OTC) drug. The Environmental Protection Agency (EPA) regulates insect repellent products. Use insect repellent that contains active ingredients that have been registered with EPA. An EPA registration number on the product label means the product has been evaluated by EPA to ensure that it will not pose unreasonable harmful effects on people and the environment. Spray insect repellent on clothes or skin, but not on the face. Don't use insect repellent on babies. Repellent used on older children should contain no more than 10 percent DEET. Oil of eucalyptus products should not be used in children under 3 years. Don't use insect repellent that's meant for people on your pets. Use insect repellent according to the labeled instructions. Avoid applying it to children's hands, around the eyes, or to areas where there are cuts and irritated skin. Store insect repellent out of children's reach. Wash the repellent off with soap and water and contact a Poison Control Center (1-800-222-1222) if you (or your child) experience a reaction to insect repellent. After returning indoors, wash skin with soap and water to remove repellent. It's best to scrape a stinger away in a side-to-side motion with a straight-edged object like a credit card. Don't use tweezers because it may push more venom into the skin. After removing a stinger, wash the area with soap and water. You can apply ice or another cold compress to help reduce swelling. Wearing light-colored clothing makes it easier to spot ticks. Check for ticks after outdoor activities. If you find a tick, remove it with tweezers. Grasp the tick as close to the skin as possible and pull it straight out. Then drop it in a plastic bag, seal it up, and throw it away. Early removal of a tick is important because a tick generally has to be on the skin for 36 hours to transmit Lyme disease. People who want to get a tick tested for disease or other information could check with their local health departments to see if they offer tick testing. After removing a tick, you can cleanse the area of the tick bite with antiseptic, such as rubbing alcohol or soap and water. Oral OTC antihistamines can bring itch relief. Oral OTC drugs, such as ibuprofen and acetaminophen, can provide relief of pain from bites and stings. In addition, there are many topical OTC drugs that are applied to the skin and can provide itch and pain relief. Some of these topical OTC drugs are labeled as "external analgesics" or "topical analgesics." They contain ingredients such as hydrocortisone, pramoxine, and lidocaine. There are also topical OTC drugs labeled as "skin protectants" that provide itch relief for insect bites and stings. These products contain ingredients such as colloidal oatmeal and sodium bicarbonate. Keep kids' nails short. If they scratch the area and break the skin, it can lead to a bacterial infection that will require treatment with antibiotics. Signs of allergic reaction: Some people can experience anaphylaxis, a severe, life-threatening allergic reaction. This is a medical emergency that warrants calling 9-1-1 immediately. Signs of an allergic reaction, which may occur within seconds to minutes, include sneezing, wheezing, hives, nausea, vomiting, diarrhea, sudden anxiety, dizziness, difficulty breathing, chest tightness, and itching or swelling of the eyes, lips, or other areas of the face. If you or your child has ever had an allergic reaction to a sting or bite, you should be evaluated by an allergist. In some cases, you may be advised to wear a medical identification tag that states the allergy, and to carry epinephrine, a medication used to treat serious or life-threatening allergic reactions. Sometimes allergy shots may also be recommended. Symptoms of Lyme disease: Lyme disease, which is transmitted through the bite of an infected tick, can cause fever, headaches, fatigue, and a skin rash that looks like a circular red patch, or "bull's-eye." Left untreated, infection can spread to the joints, heart, and nervous system. It is rarely, if ever, fatal. Patients who are treated with antibiotics in the early stages of the infection usually recover rapidly and completely. Antibiotics commonly used for oral treatment include doxycycline, amoxicillin, or cefuroxime axetil (Ceftin). People with certain illnesses related to the heart or the nervous system require intravenous treatment with drugs such as ceftriaxone or penicillin. Symptoms of West Nile virus: West Nile virus, which is transmitted by infected mosquitoes, can produce flu-like symptoms including fever, headache, body aches, and skin rash. While most infected individuals have mild disease and recover spontaneously, infection can be serious or even fatal. There is no specific treatment for West Nile virus. Symptoms of Rocky Mountain spotted fever: Initial symptoms may include fever, nausea, vomiting, severe headache, muscle pain, and lack of appetite. The characteristic red, spotted rash of Rocky Mountain spotted fever is usually not seen until the sixth day or later after symptoms begin. 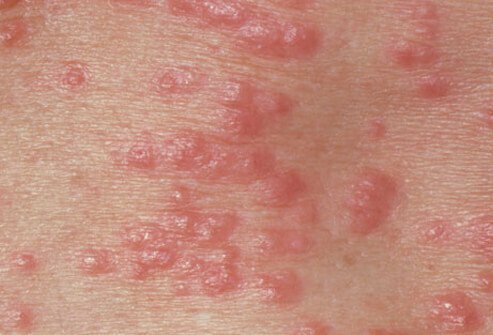 As many as 10% to 15 % of patients may never develop a rash. Rocky Mountain spotted fever is treated with antibiotics. Signs of infection: It is normal for a bite or sting to result in redness of the affected area and minor swelling. But if a bite or sting becomes infected, a fever may develop or the redness or soreness may worsen. In cases of infection, an antibiotic is the typical treatment. What do bed bug bites look like? See spider bite pictures and learn how to identify bug bites from mosquitos, bees, bed bugs, wasps, and more. See what their bites & stings look like and how to treat bug bites. Please describe your experience with bug bites and stings. Please share tips for keeping insects away from you and your home. If you've been stung by a bee, how did you or someone else remove the stinger? Please share your experience. Bug bites hurt and are itchy. What works for you in relieving the pain and itchiness? How do you prevent tick bites? If you've found a tick on someone, how did you remove it? Learn how to identify black widow and brown recluse spiders. There are many symptoms associated with a black widow or brown recluse bite. See medical images of dangerous spider bites that can turn deadly. Get first aid instruction for spider bite treatment. Brown recluse spider bites often go unnoticed initially because they are usually painless bites. See a picture of Brown Recluse Spider Bites and learn more about the health topic. Cellulitis is an acute spreading bacterial infection below the surface of the skin characterized by redness, warmth, inflammation, and pain. The most common cause of cellulitis is the bacteria staph (Staphylococcus aureus). Chiggers are a mite belonging to the Trombiculidae family. Chiggers are most commonly found in grassy fields, gardens, parks, forests, and moist areas around lakes or rivers. Contrary to popular belief, chiggers do not burrow into the skin. Chiggers insert a feeding structure into the skin and inject enzymes that destroy host tissue. The chiggers then feed on this dead tissue. The most common symptom of a chigger bite is itching. Treatment generally includes antihistamines and calamine lotion. Painful headaches can ruin your productivity and quality of life. But what triggers headaches and migraines? Learn some surprising causes of headaches and migraines plus how to find relief. 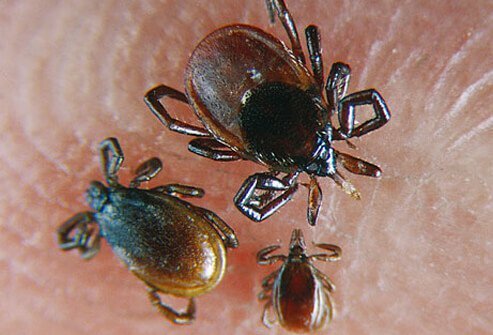 Lyme disease is caused by the bacterium Borrelia burgdorferi transmitted to humans through infected deer ticks. Lyme disease symptoms include a bull's-eye shaped rash. See pictures of Lyme disease rashes and ticks that carry Lyme disease. Sepsis (blood poisoning) is a potentially deadly infection with signs and symptoms that include elevated heart rate, low or high temperature, rapid breathing and/or a white blood cell count that is too high or too low and has more than 10% band cells. Most cases of sepsis are caused by bacterial infections, and some cases are caused by fungal infections. Treatment requires hospitalization, IV antibiotics, and therapy to treat any organ dysfunction. Most spiders in the United States are harmless; however, black widow and brown recluse spider bites may need medical treatment. Symptoms of a harmless spider bite generally include pain, redness, and irritation. Signs and symptoms of black widow spider bite include pain immediately, redness, burning, and swelling at the site of the bite. Sometimes the person will feel a pinprick or double fang marks. Brown recluse spider bite symptoms and signs are a mild sting, followed by severe pain and local redness. These symptoms usually develop within eight hours or more after the bite. Black widow and brown recluse spider bites have similar symptoms, for example, nausea, vomiting, fever, headache, and abdominal or joint pain. Generally, brown recluse and black widow spider bites need immediate medical treatment. If you think that you or someone you know has been bitten by a brown recluse or black widow spider, go to your nearest Urgent Care or Emergency Department for medical treatment. Ticks are known transmitters of disease to humans and animals. Tick-borne diseases include Lyme disease, Rocky Mountain spotted fever, Q fever, tularemia, babesiosis, and Southern tick-associated rash illness. Infected ticks spread disease once they've bitten a host, allowing the pathogens in their saliva and mouth get into the host's skin and blood. Tick bites are typically painless, but the site of the bite may later itch, burn, turn red, and feel painful. Individuals allergic to tick bites may develop a rash, swelling, shortness of breath, numbness, or paralysis. Tick bite treatment involves cleaning and applying antibiotic cream.